calendar may say we should be hitting summer, but the weather in the Pacific Northwest is dictating otherwise. Leave it to New Belgium Brewing to bring that summer feeling to even the gloomiest of regions! Somersault is that little bit of liquid sunshine. apricot, ginger root and oats into the mix creating an elegant, smooth, fruity beer. 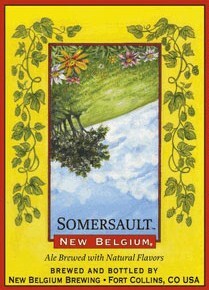 Somersault is 5.2% ABV and medium bodied so you can enjoy this beauty all summer long.